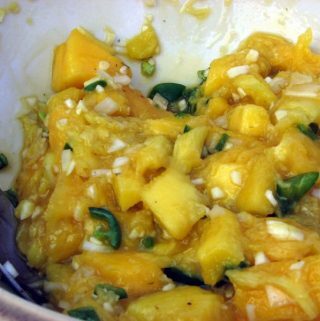 In preparation to make another one of Ruth Beranbaum’s amazing mango tarts, I ventured out to the store to pick up some mangoes and other ingredients and stumbled upon a bin of ripe, small ataulfos. When I say small, what I mean is that the whole bin full of atualfos were runt-like ataulfos – perhaps about 4 inches long on the generous side. (ataulfos are small to begin with, these were VERY small – about 2/3 the normal size) The price was appealing – 3 for $1.00. Sold. I bought a whole mess of them thinking I’ll have plenty of leftover mangoes to enjoy even after the tart is long gone. Here’s what happened. I let them sit for a day and then broke into them when it was time. After I had cut through a few, I started to think Uh-Oh. At least HALF of the mangoes were spoiled. They weren’t overripe, but the flesh had swaths of pale brown running lengthwise. 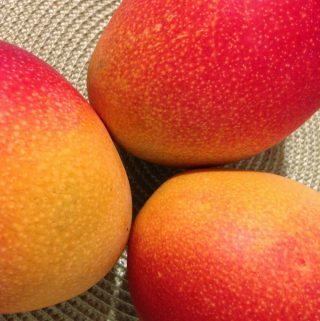 Unlike some of the spoiled mangoes I’ve seen before, such as ones suffering from Diplodia, these mangoes looked GREAT on the outside. This happens occasionally (good on the outside, bad on the inside) but NEVER have I seen it at the 50% ratio. This tells me that something goes haywire when undersized mangoes are picked when they aren’t ripe. I’m going to reach out to some mango friends for answers, but as mango consumers just know that small/undersize mangoes may be bad news. I’m going to steer away from them in the future – no matter how cute & visually appealing the little buggers are. You heard it hear first. And to finish story – I BARELY had enough for my mango tart – a birthday offering to my hubby. Never again on the small mangoes. Previous Post: « Red Mango & Scarlett Mango. Really Safeway? Your Produce Marketing BS is being outed… Right Here. Right Now.